Description: Lot of nine firearm reference books. 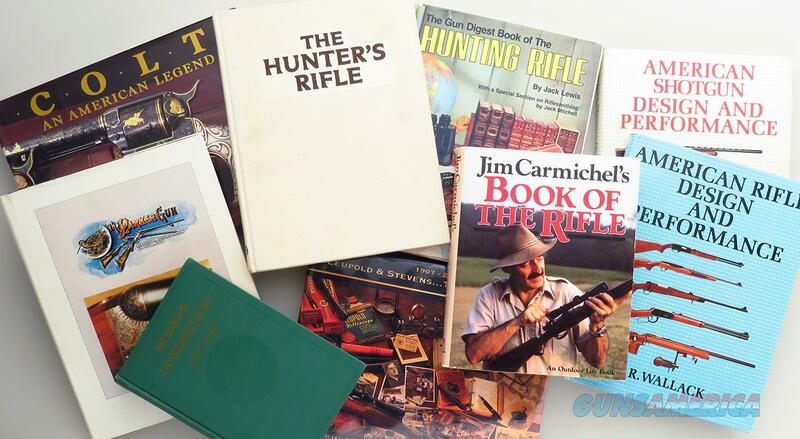 Titles include: Book of the Rifle, Carmichel, 1985, Outdoor Life, excellent; Modern Gunsmithing, Baker, Small-Arms Technical Publishing Company, very good; The Parker Gun, Baer, 1980, Beinfeld,very good with good DJ; The Hunter's Rifle, Askins, 1984, NRA, excellent with light soiling to cover; The Gun Digest Book of the Hunting Rifle, Lewis, 1983, DBI; American Shotgun Design and Performance, Wallack, 1977, Winchester Press, excellent with chipped DJ; American Rifle Design and Performance, Wallack, 1977, Winchester Press, excellent with chipped DJ; Leupold & Stevens, The First Century, van Zwoll, 2007, new in wrapper; Colt, An American Legand, Wilson, stated First Edition, Abbeville Publishing, excellent. The price is firm. Photos by request (include direct email address).